As with every region in the Porsche Club of America (PCA), the Milwaukee Region got its start because of the enthusiasm of a core group of Porsche owners who enjoyed the people who owned the cars as much as the cars themselves. 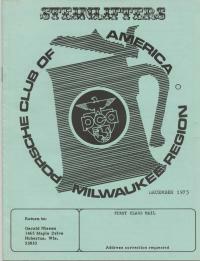 Records show the Milwaukee Region was the 27th region to be formed in PCA, having received its charter in April 1960. Our history, however, dates back several years to the formation of Region No. 6, which was named Chicago-Milwaukee Region. One of the prime movers behind this initial effort was Wisconsinite Gene Bussian. (Mr. Bussian passed away in 2015). 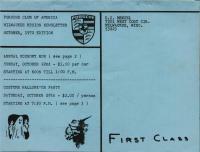 He began writing letters to Bill Sholar back in the summer of 1955 and, that year, became a charter member of PCA. It took a while longer to round up other interested Porsche owners in southern Wisconsin and northern Illinois, but by 1957, the new region was in business. Membership and activities mushroomed. The Chicago-Milwaukee PCAers were the hosts of the famous Fourth Parade, held in 1959 at Nippersink Manor in southern Wisconsin. That was later the site of the Parade in 1964. After a little over two years of operation, it became apparent that the northern Illinois area alone could support its own region and a split should be made at the state line. Beginning in January 1960, the original Chicago-Milwaukee region officially became known as the Chicago Region. This meant that Wisconsin PCAers had to go through the formalities of forming an entirely new region. Several organizational meetings were held by the required provisional committee of 10. 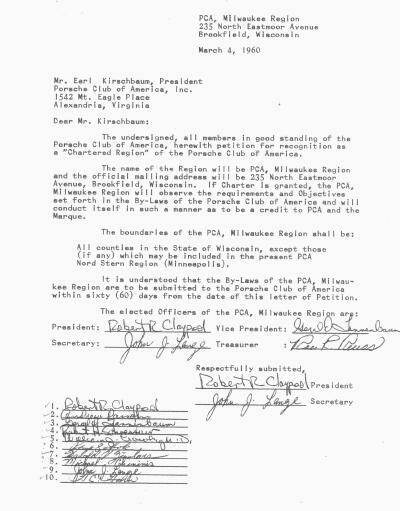 By mid-Spring, the new Milwaukee Region received its charter, dated April 30, 1960, from PCA headquarters. The original charter members included Bob Claypool. Andy Passon, Gerry Tannenbaum, Bob Schoessow, Bill Crowley MD, Ray Schok, Hal Zimdars, Mike Chinnis, Jack Lange, Rae Reuss and Buzz Hahn. At the time, most of the state of Wisconsin was included in the region except for several counties adjacent to Minnesota. Later, Central Wisconsin and Fox Valley region were formed as Porsche ownership grew in the state. In 1960 a concentrated membership campaign yielded a roster of 60 active members at the end of the first year. At that time, there was a total of approximately 75 Porsches registered in the entire state. Splitting Chicago and Milwaukee by a regional boundary line had little effect on the close relationship that existed between the two regions at that time. A spirit of close cooperation and friendly competition had been nurtured. At the time, members from both regions attended and participated in the other region's activities. A jointly sponsored Economy Run to New Glarus involved teams of nine Porsches that represented each region destined for New Glarus via different routes of the same length. The Milwaukeeans bested their rivals by only a few hundredths of a mile per gallon by team average. In those early days, to give every member a chance to participate in the kind of activity he/she liked, the events ran the gamut from high speed autocrosses to purely social get togethers. Gymkhanas, low-pressure rallies and tech sessions rounded out the annual schedule. During the earliest days of the region members took advantage of several tracks for road racing including Road America, the Milwaukee Mile at State Fair Park and Lynndale Farms' 2.5-mile layout where the club held practice runs, autocrosses and regional races. The early group of region members also worked to identify a parking area within Road America exclusively for Porsches. Known as Porsche Park, this small plot was upgraded and fenced in with a single-entry point to accommodate more than 100 Porsches. Perhaps the greatest single physical activity ever attempted by the region members in the early days was the erection of a sign in September 1965 to identify Porsche Park. A four-sided sign was professionally designed and carefully construction, holding to Porsche style and colors. The sign featured the Porsche crest and the PCA logo. The first Porsche dealer in the state was Wisconsin Auto Sales, 642 N. 7th Street, in downtown Milwaukee (Wisconsin Ave. and N. 7th St.) where Harold Zimdars maintained founding member Bob Claypool's 1952 356. Minutes from the 1960s indicate that board meetings started after 8 p.m. and generally ran past 11 p.m. A secretary's record noted that one meeting almost spanned two days as the board worked close to midnight before adjourning. The board meetings at the time were held in a member's home. In late 2014, Milwaukee region members Gary Messing, Renee Messing and Donna Daufenbach got together with early region members Gene Bussian (now deceased), Hal Zimdars and Bob Claypool to hear about the region's earliest days. This conversation was captured in a series of posts to the region's YouTube channel. By the mid-1970s, Porsche ownership in the area had grown and so did club membership. In 1974, the Milwaukee Region had 75 members and by 1979 the number had doubled. Region members were having a great time. A highlight of the 1978 holiday party was homemade cookies shaped like a 356 model. 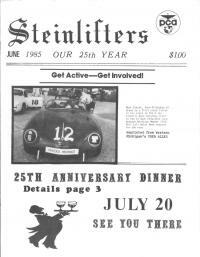 The region's newsletter, Steinlifters, evolved from typewriter and mimeographed format to a more professional layout. Steinlifters started running ads in the late 1970s and featured a color cover by the end of 1979. The region hosted challenge slaloms in the late 1970s as well as the Great Pumpkin rallye, a regular event in October for many years. The term autocross is now used in place of challenge slalom. Region members have always taken great pride in showing their Porsches. In 1981, four Milwaukee Region members drove their 911s and 356s to Iola, Wis., to participate in the annual car show that covered several acres in the central Wisconsin town. In 1982, club membership rose to 160 members - the same year the club had a beer tasting party as part of its social schedule. Sporting events sprinkled the region calendar, too. Tech sessions were as popular in the early days of the region as they are today. A tech session in 1982 hosted by Jeffords featured a unique combination of topics: quality control and crash testing. In 1984, members viewed Porsche-Audi technical films. In 1985 energetic members participated in a cross-country skiing event at Devils Lake. This is the same year that the region hosted the "Ice Scream," a timed event run on the ice of Friess Lake in Washington County. Clearly, region members were not content to hibernate during the winter months. By 1986, membership reached 221. The 1990s marked the start of a new tradition that continues today -- Carrera Chili and Turbo Spaghetti. Members compete with their recipes of chili one year and spaghetti sauce the next. A member typically hosts the gastronomic event at his or her home. Camaraderie is the main ingredient that makes these late winter gatherings so successful. Membership grew steadily from 1986 to 1995. By 1995, 315 members comprised the Milwaukee Region. Three years later, in 1997, membership revved again, to 431. The year 1997 was marked by the launch of the region's first Web site. Members were now able to receive club news via the Internet as well as the newsletter. At the start of the new millennium, membership reached 454. In the year 2000, a large committee of Region members began meeting in earnest. They had a major task to accomplish-the Milwaukee Region had earned the honor of hosting the 2001 Porsche Parade. No strangers to Parade, in its history, the Milwaukee Region has been associated with several parades. Its first Parade experience came in 1959, when the region was combined with Chicago. The 1959 Parade was at Nippersink Manor, a resort area just north of the Illinois/Wisconsin border. In 1972, the Chicago Region hosted Parade, this time in Lake Geneva, Wis., in the Milwaukee Region's backyard. A dozen years later - in 1984 - Chicago again won the nod from National and hosted this Parade in Appleton, Wis., north of Milwaukee. In 2001, more than 1,000 PCA members, with approximately 600 Porsches, enjoyed a week of Milwaukee's finest hospitality for PCA Parade. Highlights included the traditional concours d'elegance against the sparkling backdrop of Lake Michigan on Milwaukee's lakefront, an autocross in the parking lot of the Wisconsin State Fairgrounds west of the downtown area, a rallye in the scenic hills of Wisconsin's kettle moraine countryside and a superb drivers education experience at Road America, a premier track less than an hour from Milwaukee. Gary and Renee Messing, 2001 Parade co-chairs, were assisted by a dedicated team of Milwaukee Region members who executed every aspect of the Parade schedule with the greatest attention to detail. 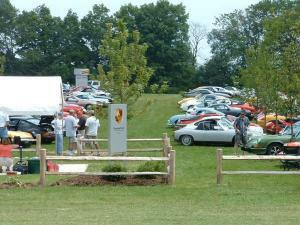 In 2004, Milwaukee Region members renovated Porsche Park, the dedicated parking area for Porsches at Road America. The renovation included new signage, landscaping, fencing and a picnic area. Porsche enthusiasts throughout Road America's season enjoy Porsche Park. Porsches filled the park in July 2004 for the re-dedication event which also included a concours d'elegance competition. 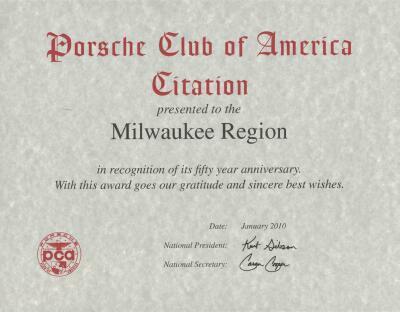 The Milwaukee Region celebrated 45 years as a chartered region with Porsche Club of America in 2005. The milestone was duly noted with an anniversary party at the Miller Inn, the hospitality center for Miller Brewery in Milwaukee. Members and their guests toured the brewery which has been in Milwaukee since 1855 when Frederic Miller, a German immigrant, founded his Plank Road Brewery on what is now Milwaukee's near west side. Following the tour, gemutlichkeit -a relaxed, comfortable feeling - was in the atmosphere as members told stories of the early days of the Region and toasted the region's milestone. The year's annual awards for the autocross and concours d'elegance series also were presented at the anniversary banquet. The year 2006 marked another historic milestone for the region with the inaugural The Milwaukee Cup Club Race, the region's first undertaking of a PCA staple - club racing. A dedicated group of volunteers worked for more than a year to organize the region's first race, which was run at the Autobahn Country Club in Illinois. A highlight in 2007 was the Milwaukee Region's sponsorship of Celebrate Porsche, held in July at the Porsche Park at Road America during the Kohler International Challenge with Brian Redman. With Porsche as the featured marque during the 2007 KIC, the Milwaukee Region hosted a spectacular event that included a display of vintage Porsche race cars, interesting talks by famed factory-sponsored drivers such as Brian Redman and a region concours d'elegance competition. In 2008, the region hosted its first drive for veterans in which veterans from the Zablocki Medical Center in Milwaukee were treated to a ride around the track at Road America by drivers who were participating in the region's driver education event in May. The year 2009 brought members together for driver education events shared with the BMW club, several half-day driving tours organized by the social committee, the annual spring and fall longer driving tours hosted by Lee and Jay Heppe, three autocross events, well-attended tech sessions and more. 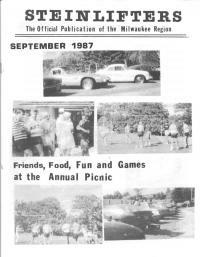 A highlight of the region calendar in 2009 was a joint region picnic organized by the Milwaukee and Fox Valley regions. More than 80 members and family members got together in early September at Porsche Park at Road America. Everyone brought a dish to pass to complement the burgers and hot dogs that were grilled under blue skies. Track action was supplied by the Chicago Region-hosted Club Race qualifying heats. The year's activities concluded with a casual fish fry in mid-November. Autocross awards were presented at that event. 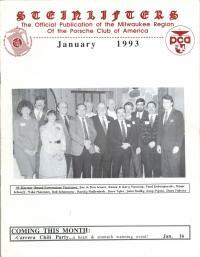 In 2010, the Milwaukee Region celebrated 50 years as a chartered region of Porsche Club of America. A series of events bearing the theme "Everything Porsche" were conducted throughout the year to mark the 50th anniversary. The first event was Turbo Spaghetti in February and that was followed by a general membership meeting on April 30 -- 50 years to the day that the region was formed -- at Milwaukee's Harley Davidson museum in Milwaukee. A two-day drivers education event at Road America followed in May. In June, an all-day Spring driving tour marked the 50th. In July, the region hosted a special activity within Porsche Park at Road America during the 2010 Kohler International Challenge with Brian Redman. Brian was a special guest at the event as he captivated members who gathered to hear his tales of his racing days with Porsche. In August, a free autocross school was held for novice drivers, along with special catered box lunches for all drivers and spectators. A gala banquet in late September at the Wisconsin Country Club concluded the year-long Everything Porsche celebration. More than 80 members and guests attended and enjoyed a thoroughly entertaining evening with a silent auction, great food and speakers. Thanks to the 50th anniversary committee members Ron Pace, co-chair; Gary Messing, co-chair; Renee Messing, Al Wagner, Don Kiepert, Mike Jurkowski and Bev Jurkowski for their planning and execution, along with all the committee chairs who played a role in making each anniversary-themed event special. In 2011, with spring in the air, members turned out for one of the region's largest gatherings ever for a fish fry - a Milwaukee staple. The year unfolded with an autocross at Wisconsin State Fair Park in addition to events at Miller Park, a driver education at Road America, spring and fall driving tours, day-trips to Elkhart Lake to take in the historic Road&Track magazine concours, casual dinners and more. In 2012, the Milwaukee Region is going strong in its 52nd year, with more than 500 regular members. The year's activities began with a couple cold-weather favorites, a February garage gathering complete with a race track simulator, and plenty of bench racing conversation, followed by the Milwaukee Region classic Turbo Spaghetti. A full complement of social events, including a heavily attended Friday Fish Fry, day trips, and a new series of classroom sessions to introduce Driver Education to newcomers interested in learning more about high performance driving on actual race tracks were part of the calendar. Autocross events held at Miller Park and a new venue at State Fair Park were well attended. The annual Driver Education event held at Road America which is always a favorite for the track junkie gang was moved to mid-August as a single day event. The warm weather was a nice change from the chilly and somewhat unpredictable conditions when the event was held in May. The year wound down with the return of colder temps, but warm memories remain strong with an October Fall Driving Tour and festive Holiday Party in December. The Porsches may be headed for their winter hibernation, but The Milwaukee Region never really rests and planning for 2013 was already well under way. The year 2013 continued the pattern of excellence as region members celebrated the 50th anniversary of the 911 and attended preview events for several new Porsches, thanks to the involvement of our local Porsche dealers. We held our tried and true events such as Carrera Chili in the dead of winter along with our summer autocrosses and one-day driver education event at Road America, our home track. Driving tours were well attended. We repeated the success we had in 2012 by holding a driver education introductory course to familiarize those who are new to DE. We also enjoyed the monthly Cars and Coffee events in Lake Mills and our own monthly Coffee Travelers, a gathering of members at various coffee shops in the five-county area of Southeastern Wisconsin. The summer picnic was held again in 2013 with blue skies, great food and even better conversation. Several region members took advantage of the close proximity of Parade 2013 and traveled as a group to Traverse City. No doubt, 2013 was full of opportunities to enjoy our Porsches and the people who drive them. In 2014, membership hovered at the 500 mark. A holiday party in January kicked off the year with members gathering at the Fox & Hounds in Hubertus, Wis. Turbo Spaghetti, a tradition that began decades ago, brought members together in February. The gimmick rallye returned to the region in 2014, marking the first time in many years that members had the chance to test their observation skills. Rallyemaster Bob Budecki hosted two sessions for orientation before the drivers and navigators took to the roads in the Kettle Moraine area. The Great River Road weekend tour, led by Al and Ellyn Wagner, took members to the western part of the state. Our DE day at Road America was a thrill for everyone in August. Also in 2014 we enjoyed many casual get togethers over coffee and also included a few longer, follow-the-leader type drives to secure the hot brew, traveling to DePere and Burlington. As we did in 2013, we again participated in the Milwaukee Masterpiece Club Saturday and Cedarburg's Octoberfest event. Region members kicked off 2015 with a holiday party at the Copper Dock in Hubertus. Carrera Chili, which alternates with Turbo Spaghetti, was on the schedule for the year with 50 attending. Carl and Carrol Jensen were our hosts. We also enjoyed a general membership meeting at Delafield Brewhaus to observe our region's 55th anniversary. The event was well attended, bringing out long-term members as well as new members. Several former region presidents were on hand to mark the occasion. The Wagners hosted the Great River Road Part II weekend driving tour in the Mississippi River region of southwestern Wisconsin. A Gimmick Rallye in the Kettle Moraine area provided fun and challenges. Members attended 60th Parade in French Lick, Ind., an easy drive from SE Wisconsin. DE at Road America made its appearance on our calendar, too. We also found our way to a winery in Jefferson, Wis., the Poppin' Corks Winery, which we toured. Most months we gathered for coffee and conversation at local coffee shops. These casual, informal gatherings usually attract 10 to 15 people, regardless of the weather. With the holiday season typically jammed with events, the region held its holiday gathering in January 2016. The event at Mo's, A Place for Steaks, was a big hit with excellent attendance. In January we also gathered to watch the start of the 24 Hours at Daytona endurance race at the Delafield Brewhaus. In February we enjoyed Turbo Spaghetti with Mike Wiviott hosting us. The DE committee started meeting in March to plan for the region's August event at Road America. In April, we headed west to Madison for a tech session at Kelly-Moss. Pete DeVries again provided outstanding information about the work they do for race teams as well as customers' cars. In May we were drinking fresh beer, thanks to a tour at MillerCoors. Later in the month we were testing our cars on a weekend driving tour along the Great River Road in western Wisconsin. If you have not participated in a tour led by Al and Ellyn Wagner, you're missing out. May also was the month for the first of two autocross events. We really got busy in June with a tech session at Prestige Auto Works, a gimmick rallye and a driver's clinic for DE. In June, several members took part in the national Parade in Jay, Vermont. In July we did a follow-the-leader drive to Elkhart Lake to take in the street concours and dinner. August was all about safe driving at Road America during our one-day DE event. We entertained veterans again from the Zablocki Medical Center. We also showed our cars at the Show & Glow by the Lake event at Veterans Park and also attended PorschePlatz at Road America. In September we enjoyed our second autocross and also checked out the Blind Horse Winery in Kohler for a tour and lunch. We also participated in a walking and dining tour of Milwaukee's Third Ward. October called for showing our Porsches in Cedarburg as well as a driving tour to Lake Geneva and a tour of the lake and lunch on board the Grand Geneva tour boat. November set the stage for a fish fry tour of three different restaurants. The tour, by bus, concluded with custard at Leon's in Milwaukee. In December, as with most months, we got together for coffee. Members and their Porsches. There's always something to talk about. 2018 started with a Holiday Party in January at the Wisconsin Club. The season schedule included Turbo Spaghetti, autocrosses, interesting tech sessions, monthly coffee travelers, a picnic, the revival of the region concours competition and more. From humble but enthusiastic beginnings, the Milwaukee Region today is proud to boast a steady base of members. This longevity has been achieved because of committed leadership and involved members. With that combination, the Milwaukee Region's future is as bright as a shining, meticulously detailed Porsche.